Combine soy sauce, lemon juice and 1 tablespoon of the ginger and brush the salmon fillets on both sides with the mixture, then dredge in the sesame seeds. Heat the olive oil in a large skillet. Add the salmon to the pan, and cook over moderately high heat until the sesame seeds turn golden and the fish is just cooked through, about 5 minutes per side. Meanwhile cook the soba noodles for about 4 minutes or according to package. Drain the noodles and transfer to a medium bowl. Add sesame oil, scallions, 1 tablespoon of ginger and the remaining soy-ginger mixture to the noodles tossing to combine. 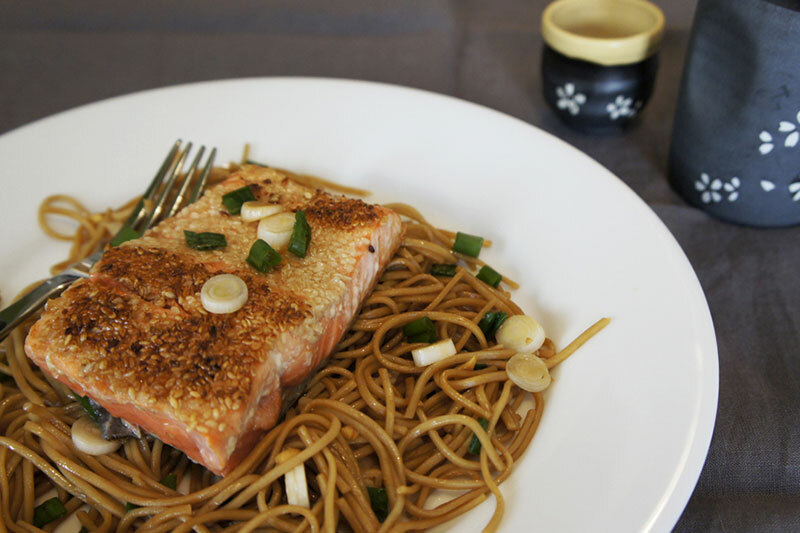 Serve soba noodles topped with the salmon fillets. View the original instructions on the Food & Wine website.